An illustration of our product development process presented as a case study. 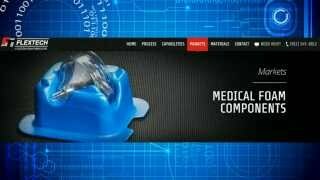 A significant portion of our business is in manufacturing custom foam components for medical device companies, from start-ups to Fortune 500 corporations. 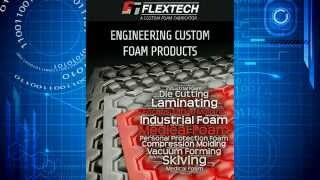 We are involved in the design, development, and manufacture of unique, fabricated and molded foam components; including patient interface parts for diagnostic and therapeutic applications, comfort pads for orthopedic supports and braces, medical device packaging and more. A Fortune 500 medical device company approached Flextech to see if we could solve a problem they were experiencing with a kit of surgical tools and accessories used in cardiac surgery. The kit includes a blood pump that is used during the surgical procedure. 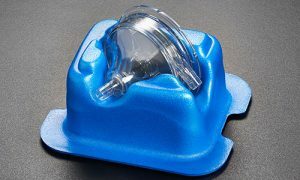 The pump is both fragile and expensive and was packaged using a vacuum-formed, high-impact polystyrene (HIPS) plastic tray. Unfortunately, the polystyrene tray wasn’t robust enough to provide adequate protection for the pump. If the kit was mishandled during shipment, the tray would break and the pump would be damaged as well. A damaged pump would render the entire surgical kit unusable. Also, replacing the broken pump was time-consuming and costly. Our technical sales expert met with the customer’s packaging engineering team in order thoroughly understand the existing problems with the HIPS tray the pump was packaged in. Additionally, it was necessary for Flextech to learn the customer’s expectations for the functional requirements of a new tray material and design so that we could suggest suitable materials and develop a new tray design. After thoroughly studying the problem, Flextech suggested a new tray design. This tray would be compression molded from a medium to high-density cross-linked polyethylene foam. We believed one of these materials would provide impact protection and resilience to protect the fragile blood pump. The customer was very interested in our proposed molded foam tray. 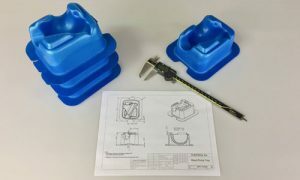 We provided a quote for the prototype tooling and several molded foam trays that would allow them to perform drop tests using trays with different densities of cross-linked polyethylene foam. The prototype development cost was approved and the customer issued a purchase order. 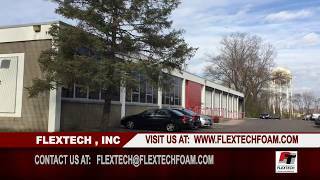 Flextech built the prototype tool and sourced cross-linked polyethylene foams of various densities that we would use to mold prototype parts. 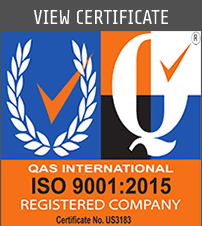 Our intention was to provide our customer with a range of materials to evaluate and test. 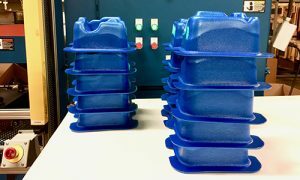 We initially struggled with compression molding the trays due to their significant draw ratio – the height or depth of a part relative to its perimeter dimensions. In the deepest tray features, the foam was stressed and tore during the molding process. Typically, using a mold release agent would solve the problem. 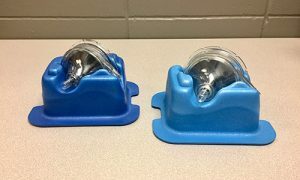 However in this case, because the tray is used to package a sterile medical device, a release agent would compromise the pump’s sterility. In order to mold the foam tray parts without tearing the material, our R & D team experimented with a number of process variables that can affect the material and the parts. After considerable experimentation we made adjustments that allowed us to successfully mold the prototype parts with no defects. We delivered the prototype parts to our customer to evaluate and perform the necessary distribution simulation testing. This testing protocol requires medical device manufacturers to test device packaging for shipping and distribution hazards that could affect the package integrity, specifically, drop testing and vibration testing. The customer tested trays made of various densities of cross-linked polyethylene foam and the results indicated that an 8 lb. /cubic foot material performed best. The tray and pump also fared well in the drop and vibration testing. Based on these test results, our customer ordered the production tooling needed to mass produce the molded foam trays. Next, we built the multi-cavity production tooling and tested it to ensure we could replicate the prototype parts. The transition from prototype tooling to production tooling isn’t always as simple and straightforward as it seems. Again, due to the depth of draw of the parts, the material was tearing in the molding process. We had to experiment with different process variables in order to mold multiple parts at once and not have any defects. 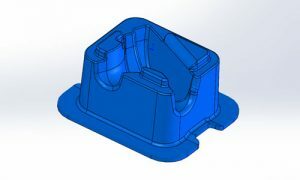 Ultimately, we were successful and we molded and inspected first article parts. 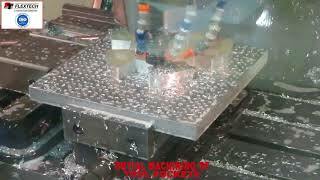 The customer also approved the production tooling, process, and parts. After receiving first article approval, we began producing parts on a monthly basis. This project has been ongoing for about 10 years, and there have been no quality issues in that time. The success of this joint product development effort between Flextech and our customer in the medical device market illustrates the benefits of close collaboration in developing a new product to meet customer needs. 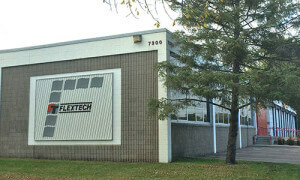 By connecting and collaborating with Flextech, we were able to help them solve an expensive packaging problem. Our thorough understanding of the functional requirements, as well as the ability to experiment with process variables, allowed us to overcome design and manufacturing challenges that may have derailed other suppliers. Following design approval, we were able to experiment and ultimately develop a cost-effective manufacturing process that allowed us to provide the functional parts they required. Finally, once our customer tested and approved our prototype parts, we were able to scale up our manufacturing process to produce and deliver high quality molded foam trays. These cross-linked polyethylene foam trays provide consistent impact protection and resilience to protect fragile – and expensive – blood pumps.